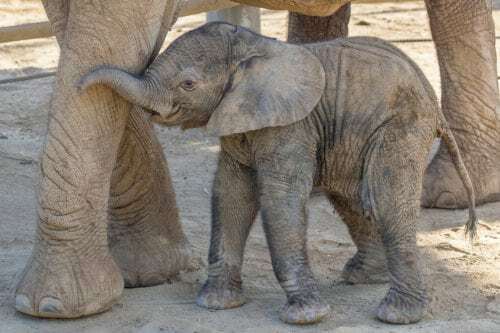 Congratulations are in order: The newest addition at the San Diego Zoo Safari Park is a 281-pound baby elephant — and it’s a girl! They include Umngani’s other offspring: 7-year-old male Inhlonipho or “Neepo”; 9-year-old male Ingadze or “Gadze”; and 12-year-old female Khos, as well as two other younger elephants, 8-year-old male Emanti and 11-year-old female Phakamile or “Kami.” They were all happy to meet the newborn elephant and touch and smell her with their trunks. If you just can’t get enough of baby elephants, check out this elephant herd saving a baby from drowning. Or how about this adorable baby elephant struggling to get out of a river? Too cute! We can’t wait to find out what the new baby elephant is named and follow along on her journey as she grows up.